The Pendants are made of Surgical Stainless Steel this used in operations and joint replacement, it is the purest stainless steel available and it is programmable. It is highly polished and beautiful, it looks like silver but you do not have to polish it! It will not mark your skin or clothes. 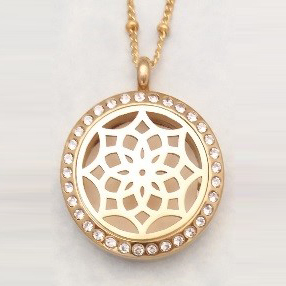 All the Pendants come with an Inner Peace Patch on a pad behind the front Filigree – and don’t we all need that energy! The Inner Peace Patch is silver with soft blue circles and looks just like an opal, when seen through the filigree. Beautiful!! It is removable, so you can change it for a colored pad to which you can add essential oils or anything else you choose, just be sure the magnetic back will close. An allergy occurs when a person’s immune system reacts to substances in the environment that are harmless for most people. These substances are known as allergens and are found in dust mites, pets, pollen, insects, ticks, molds, foods and some medicines. The body is surrounded by fields of protective energy which radiate out – a person who has larger brighter energy fields is considered to be healthy. This Bio-Energy is directly connected to the level of health of the person, in terms of physical vitality, mental clarity and emotional well-being. When a person is sick or the body is attacked it uses more of this energy. This can deplete your body’s energy fields, making the body more vulnerable to any disease or toxic energy in the vicinity, and can also be the cause of chronic fatigue. This Pendant will energetically complement the Toxic Energy Protection Pendant as the stronger and larger the bio-energy fields the less likely the toxic energy can affect the body. We are living in a very toxic environment from radiation, to the spraying of pesticides to the GMO food we eat, to say nothing of stress – it goes on, and on. A large Aura radiating out supplies the body with energy and also prevents the toxic energy we live in from being absorbed by the body. The Bio Energy Enhancer Disk contains all the Chakra energies, which feed the Aura, and enhances all the bio-energy fields specially the important etheric field. Brain wave frequencies have also been added to protect the brain plus healing energy to enhance the bio-energy. The Bio-Energy Enhancer Disk will be especially beneficial to anyone with depleted energy or an overworked immune system. I have realized for a long time that more and more people are suffering from diseases and syndromes, and many people are chronically sick, even our children. That is when I understood just how important this disk could be to these people. Application: Wear the Bio-Energy Enhancer Disk on the supplied chain which has also been programmed. Wear it whenever you need energy, or you are using a cell phone, computer, or are near electronic equipment for any length of time. You may also place it in a breast pocket or attach to underclothing, ladies could attach it to a bra strap. The disk needs to be within an inch of the body to be sure it is within the etheric field. The Bio-Energy Enhancer Disk and the Toxic Energy Disk will work together to protect the body! Create an optimum healing scenario.Stabilizing the concentration and memory capabilities. Provide Non-Toxic, Anti-Pathogenic energetic signatures to help eliminate the probable causes. Contains a complete program to enhance the natural Concentration & Focus capabilities. E-smog, EMF, EMR from Cell Phones, Electronic Equipment, Microwaves, Smart Meters etc. etc. The New AEP Toxic Energy Disk has been specially formulated to radiate the programmed energy OUT to protect the wearer from most of the toxic energy we are exposed to every day. Wear the Toxic Energy Protection Disk on the supplied chain which has also been programmed. Be sure to wear it when using a cell phone, computer or near electronic equipment. You may also place it in a breast pocket or underclothing, ladies could attach it to a bra strap. The disk radiates its protective energy out over 12 feet. We will be including scientific lab results in the future. Dirty electricity is created by most electrical devices as they operate. It is caused by interruptions in the flow of normal 60-Hertz AC (alternating current) power that travels through wires and electrical systems in homes and other buildings. These interruptions result in voltage spikes/surges and frequency variations that combine to form harmful electromagnetic fields. “EMR” (Electromagnetic Radiation): Examples of high-energy radiation include x-rays and gamma rays. They can damage DNA. Fitting under this category would be all household appliances, including the hair dryers, toasters, smart meters, and anything you plug into the wall. Combine all these different “toxic or dirty” fields and you get a “soup” of radiation that forms one big cloud of e-smog. E-Smog (Electro-smog) is the invisible electromagnetic radiation resulting from the use of both wireless technology and mains electricity. The most common sources of wireless electro-smog are: Cordless phones. Cordless baby alarms. Mobile/cellular phone masts/towers/transmitters. I would really welcome your feedback and would be happy to answer your questions. A large Aura radiating out from the body also prevents the toxic energy from being absorbed by the body – it feeds and enhances all the bio-energy fields specially the important etheric field. The Bio Energy Enhancer disk also contains all the Chakra energies, which feed the Aura. Brain wave frequencies have also been added to protect the brain, plus healing energy to enhance the bio-energy. The Bio-Energy Enhancer Disk will be especially beneficial to anyone with depleted energy or an overworked immune system.